Despite Boeing leading the Dow lower early on, many growth software stocks in the IGV ETF are back to assuming leadership for the broad market. At issue now is which side will prevail, the small caps in the IWM also bouncing back nicely after yesterday afternoon's poor close for bulls. Other software standouts this morning are the likes of DOCU FTNT VEEV, with plenty more setting up behind them which have been basing tightly for a few weeks now. I am more than willing to dip a few toes back into the growth tech waters, but want to see these early gains avoid the dreaded fade as this session develops. 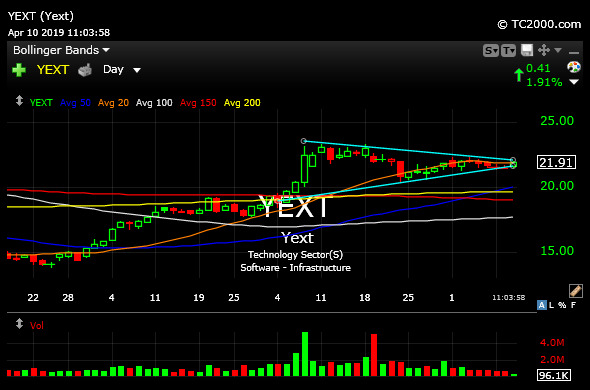 YEXT is one of those names setting up behind the movers and shakers this morning, another emerging growth story in software which is essentially at the apex of a month-long triangle consolidation, highlighted in light blue on its daily timeframe, below. If the IGV and HACK ETFs are to lead software stocks to fresh higher and tradable rally, then names like YEXT ought to use this narrow opening to catch bears and underinvested bulls off guard by sprinting higher with an imminent breakout. Failure to do so would have me back in the camp that many software names still more time to build out larger bases before any meaningful moves materialize.